Michael Lewis’ Moneyball is perhaps one of the most misunderstood stories of all time. It is a snapshot of the 2002 Oakland A’s, a team that made it to the playoffs against the Yankees in 2001, took the first two games, then never won another one. Some cold hard facts were being thrown into the A’s front office after that season: they were not going to be able to keep Johnny Damon, Jason Giambi, or closer Jason Isringhausen because they didn’t have the money to spend. General manager Billy Beane tried to get more money to no avail, so he was looking for a way to be competitive with less money. He hired Paul DePodesta (changed in the movie to Peter Brand), a whiz in sabermetrics, the statistical analysis that was made into an institution by Bill James. In short, sabermetrics dislikes those old baseball money statistics like stolen bases, average, saves and wins by a pitcher, RBI, and so on. Some stats became overvalued over time, prized by many, and GM’s gladly and unknowingly overpaid (and still overpay) players for those kinds of stats. What Beane and DePodesta looked for were undervalued players in the market that they could afford, which was the main reason for implementing the sabermetrics system, and this aspect was almost 100% ignored by the old baseball guard. They despised the idea of “moneyball” because it devalued a talent scout’s eyes in favor of complex statistics on a spreadsheet. But the A’s had to do this out of necessity. In other words, they didn’t have the luxury of hoping one of their scouts could find a player using the old scouting system that may or may not pan out. They had to find players who already had a good sabermetric track record to replace the players they were losing. They wanted guys who, specifically, could get on base. And that’s whether they got a hit or a walk, it didn’t matter. In general, the more players you can get on base, the more potential there is for runs and wins. Had the money been there, they would have kept those guys like Damon and Giambi…but they couldn’t, and couldn’t possibly find a “name” replacement. They needed to buck the system somehow. 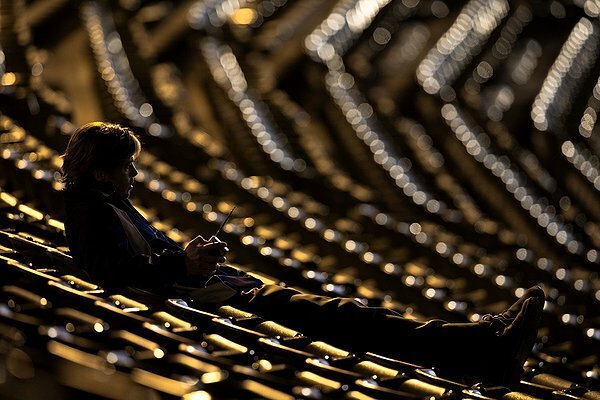 In the movie, Beane (Brad Pitt) sits lonely in Oakland Colosseum as he flips his radio on and off to the 2001 ALDS with the Yankees, who are about to finish an amazing comeback. He tries to get more money from A’s ownership, money they don’t have. When he tries to make a deal with Indians GM Mark Shapiro (Reed Diamond), a young assistant, Peter Brand (Jonah Hill) catches his eye. Beane swoops him away, and is introduced into the world of sabermetrics by a kid with an Economics degree from Yale and no baseball experience. Things are about to shake the old guard. The idea is to replace first baseman Giambi with ailing former Red Sox catcher Scott Hatteberg (Chris Pratt), outfielder Damon with former Braves standout and solid veteran David Justice (Stephen Bishop), and closer Isringhausen with a man known in the book as “The Creature,” Chad Bradford (Casey Bond), a guy with such an unusual windup that his statistics were always overlooked. This causes a retreat of Beane’s chief scout and tremendous distrust all across the other scouts. Manager Art Howe (Philip Seymour Hoffman), not pleased with his one-year contract, also doesn’t think much of the new system. In fact, one of his first acts as manager is to ignore the missive to start Hatteberg at first in favor of rookie sensation Carlos Pena (Adrian Bellani). Meanwhile, Beane has a daughter Casey (Kerris Dorsey) that he splits time with his ex-wife (Robin Wright), bringing in the personal angle as Beane’s job seems to be on the line with this newfangled philosophy. And at first, the A’s didn’t do well, bringing every critic out of the woodwork, including someone who sounds a whole lot like Joe Morgan, someone who was openly mocked for not understanding anything about Moneyball in the epilogue of Lewis’ book, and well, anything about baseball statistics in general by the fantastic former website Fire Joe Morgan, a site ran by anonymous writers who later revealed themselves to be behind the fantastic TV show Parks and Recreation. By the way, the great Chris Pratt, who plays Hatteberg, is on that show. We come full circle! But that year the A’s would start making it work: Beane took the decision to start Pena out of Howe’s hands by trading him to Detroit, and Jason’s brother Jeremy would be going to Philadelphia, making room for Beane’s team to thrive. That year, the A’s would break the American League record for winning 20 games in a row, a streak the movie treats as the team’s World Series, because, yeah, they fell short. And it’s here where the critics of “moneyball” came out and had their party, as if losing in the playoffs justified all the criticism, when the A’s weren’t supposed to even be there in the first place. Of course, since the publishing of Lewis’ Moneyball, other teams became savvy to the philosophy, and teams with money, like the Red Sox, hired GM’s like Theo Epstein who believed in the work of Bill James and were able to pay star players with the coveted sabermetrics. So the secret was out, and Beane never could quite exploit the system anymore because everyone was starting to get in on the act, or at least think twice about trading players to him that he suddenly wanted for some reason. Now it’s back to the drawing board, but the A’s lack of success over the years has been sweet vindication for Beane’s critics, and of course that’s totally and ridiculously unfair. The Moneyball movie is quite good. Pitt is now an old pro, and he’s great as Beane. I really like Jonah Hill here, branching out from his adolescent roles from the Apatow machine. I think some of the baseball scenes are a little ham-handed. During the critical 20th win in a row, we see A’s fans jumping up and down while the Royals stage a massive comeback down 11-0. This reminds me of the worst scenes from The Natural, where visiting Roy Hobbs is somehow able to end a game with a home run in the top of the ninth. It’s not dramatic enough, I guess, to be accurate about how baseball works on a home field. Director Bennett Miller (Capote) still does an overall fine job of simplifying the story and making it tense for the average moviegoer. I love baseball and love the book Moneyball, so this was a slam dunk for me despite some issues here and there…it might have been able to use a few more explanations of sabermetrics, but I can see where that would get eye-rolling for an audience. Star writers Zaillian and Sorkin put their mark on this one. Overall, this is really good stuff.